For some people, weight maintenance is simple, easy and takes no effort. From copious amounts of food to all day eating, they never seem to pack on the pounds. Unfortunately, I am not one of those people. I need to watch not only what I eat but how much I eat. A kitchen scale is an important device for me. MIRA Brands has a digital kitchen food scale that makes my eating, cooking and baking a breeze. 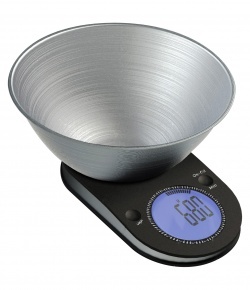 This digital scale uses a stainless steel mixing bowl. From measuring to prep, one device can simplify your whole process. With 4 high precision sensors give an accurate reading every time. When your recipe calls for exact weights, you know that your amounts are on the money. Bakers know that precise measurements are key to baking success. When a recipe offers weights not cups, tablespoons or teaspoons, a kitchen scale is an essential kitchen gadget. The MIRA Brands scale ensures that your baking success is heightened with this scale. Personally, I like this food scale because it is easy to read and is highly accurate. I can easily determine the portion controls that I need for my weight loss plan. Often it can be difficult to say that I should only eat a fistful or a deck of cards piece of protein (i.e. piece of steak, pork or chicken). If a plan says that I should eat 8 oz of chicken, this digital scale can ensure that I'm not eating too much. Now, I can only blame my will power, not improper measurement, on my over eating. The MIRA kitchen scale is a great kitchen gadget. The stainless steel design looks great on a counter top. For those who are more space conscious, this device can easily fit in a kitchen cabinet. Running on AAA batteries, the scale can be used anywhere. The MIRA digital kitchen food scale can be purchased at Amazon.com. It retails for $59.99. I learnt today that portions works wonders and I think I'm going to start using it on a regular basis.